Since its inception, Leo Baeck Temple has had a strong commitment to tikkun olam (Repairing the World). Mindful of the words of the ancient prophets and contemporary teachers, we seek to make this world a better place by doing acts of lovingkindness and by establishing justice. At Leo Baeck Temple, social action is not just a special event – but an everyday part of our communal life. This group of volunteers serves lunch to men, women, and children each month at out-patient clinics that are for AIDS/HIV infected patients. To get involved, contact the temple. Leo Baeck Temple families have traveled to the Gulf region five times to help rebuild communities that were destroyed by Hurricanes Katrina and Ike. The hurricanes are long gone, but the neighborhoods that they destroyed still need our help. Each year, about forty Leo Baeckers travel to New Orleans to make a difference. Usually taking place on the Martin Luther King, Jr. weekend holiday, we use our hands to make a concrete difference in people’s lives while learning about the city and people of New Orleans. All members are invited to join other Leo Baeckers on a journey of hope, awareness, and empowerment. For several years now, Leo Baeckers have enjoyed healthy, locally sourced, delicious fruit and vegetables for Oneg Shabbat after services. This amazing and wonderful program is made possible by temple members who sign up for one or two dates during the year. On the week of their Shabbat date, they simply go to a local farmers’ market, select fruits and veggies with the help of a provided shopping list, and drop the produce at the temple any day in the week and can submit receipts for reimbursement or tax deduction. To sign up, or for more information please contact Maribeth Scharlach at mbscharlach@gmail.com. 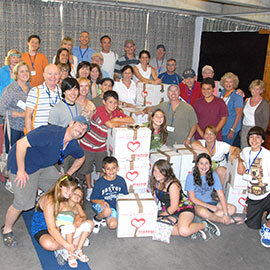 Leo Baeck Temple offers many opportunities to “get involved” and help out our community. Each of the following groups needs your help! If you are interested in helping our community please contact Executive Director Abigail Goldberg Spiegel at aspiegel@leobaecktemple.org.